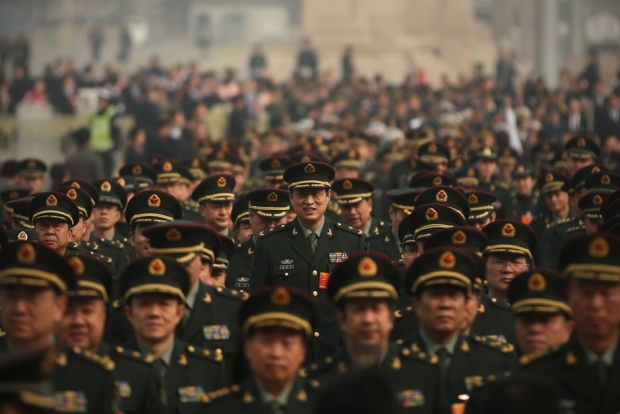 Delegates from Chinese People's Liberation Army march from Tiananmen Square to the Great Hall of the People to attend a plenary session of the National People's Congress, March 8, 2013. This story by Minami Funakoshi was originally published by Tea Leaf Nation. Is Sina Weibo, China’s Twitter, turning into a new war zone? Dai Xu, a colonel in the Chinese Air Force and military strategist, thinks so. “A month ago, a pseudo-Japanese devil [derogatory term for pro-Japan Chinese] at Shanghai’s Fudan University besieged me and Luo Yuan. Now, a gang of pseudo-American devils are pouncing on me!” cried Colonel Xu on his Weibo account, referring to the incident six weeks ago when netizens attacked People’s Liberation Army (PLA) Major General Luo Yuan for allegedly threatening to bomb Tokyo. As for this recent bird flu fad, China’s top government departments shouldn’t talk it up, otherwise it will be just like SARS in 2003! At the time, the U.S. was fighting Iraq and feared China might take advantage of the situation, so it deployed a bio-psychological weapon against China. The country was thrown into turmoil, just as the U.S. had hoped. Now, the U.S. is trying the same old trick. China should take a lesson from before and respond calmly. Weibo: A Platform for Spreading Conspiracy Theories? Many Web users, including influential public figures like Hu Xijin, the conservative Editor-in-Chief of the state-run Global Times newspaper (for which Dai Xu himself works as military strategy columnist), dismissed Xu’s conspiracy theory as nonsensical. However, to many of Colonel Xu and Major General Luo’s followers—now numbering over 252,000 and 300,000, respectively—the two officials’ military affiliations and their high-profile presence in the Weibo sphere suggest that such thinking may be prevalent in the PLA. As a result, regardless of how ludicrous their statements may seem to liberal-minded people, their messages are welcomed by left-leaning netizens as a sign that the “gun barrels” are on their side, and influence those who are already receptive to conspiracy theories. “The 2003 SARS epidemic erupted in the Pearl River Delta, brought disaster to Beijing, and triggered a nation-wide panic. The 2013 bird flu first appeared in the Yangtze River Delta, caused calamity in Shanghai, and spread public alarm. Try asking yourself, why do viruses selectively break out in China’s main economic centers, the most important cities?…There’s something fishy about this!” wrote @岳彩鹏微博 in alarm. “[Dai Xu’s] words keep us on the alert for U.S. imperialism and rapacious designs,” commented @狼跑了, apparently agreeing with Colonel Xu’s sentiment. Certain privileges enjoyed by the PLA, such as special license plates, already have drawn ire from many Web users, and Dai’s inflammatory tweets could further alienate cool-headed citizens from hawkish military personnel. Dai’s sensationalist language presents opportunities for public mockery; Global Times Editor Hu Xijin wrote, “[Dai Xu] will pay a price in terms of his image and reputation.” What Hu does not address, however, is whether the public image and reputation of the PLA will pay a similar price as a result of Dai’s rants.